One of the last truly open spaces in the urban Honolulu area, the 3,716-acre Moanalua valley narrowly escaped destruction as a potential corridor for the H-3 freeway, and was under threat of residential development for two decades. In 2008. The Trust for Public Land and the State of Hawai‘i Department of Land and Natural Resources (DLNR) banded together to purchase and protect the land in perpetuity. 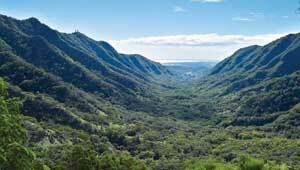 Moanalua Valley contains five distinct forest types and over nine miles of streams. The native forest provides important habitat for endangered plants and animals, including the 'Elepaio forest bird (a Hawaiian symbol of canoe making), and is the location of the last sighting of the O`ahu Creeper, now thought to be extinct. The Valley houses several culturally important sites, including a famed pohaku (stone) carved with unique petroglyphs of winged warriors. It also features stone bridges hand-crafted by Italian masons in the late 1800's. The Valley is now managed by the State Department of Land and Natural Resources and is open to the public for hiking, hunting, cultural resource preservation, and education. Watch this video for more information about the project.